The bustling city centre has a wide variety of shops, from High Street favourites to quirky independents. Be sure to check out the famous Covered Market [Market St] which is over two centuries old and is home to around 60 mostly independent businesses offering a wide variety of products and services. If you’re into cake making and decorating, there’s The Cake Shop [123-127 Avenue 4, The Covered Market]), which does what it says on the (cake) tin and sells ready made cakes, decorating supplies and icing. 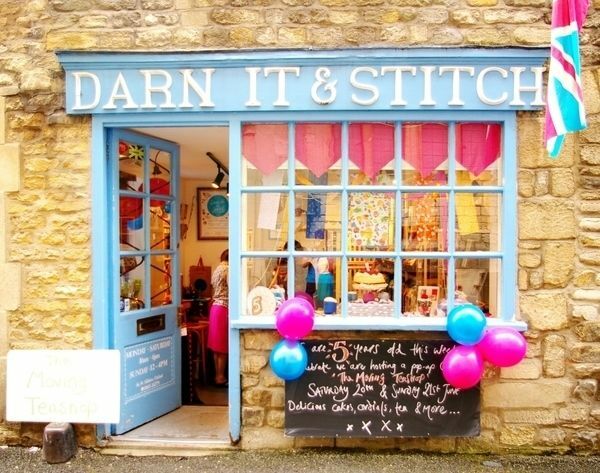 Darn it & Stitch [Blue Boar St,, 6 St Aldate's] is one such independent. 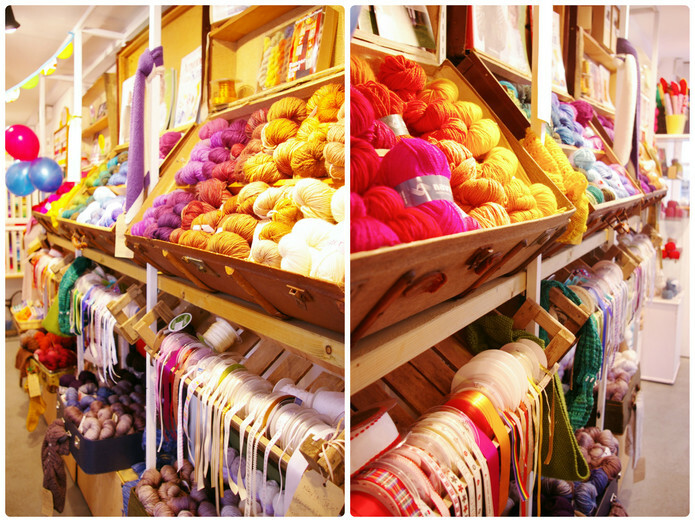 It opened in 2010 and stocks a gorgeous array of items including fabrics, ribbons, trimmings and wool. They also run workshops above the shop. Another shop stocked full of lovely things is Amy Surman [75 Wilkins Rd] aka The Oxford Bead Shop. This is an oasis of shiny pretty things in south-east Oxford, a little way out from the centre but well worth a trip if you love beads. There are a huge number of workshops on offer here, covering a range of techniques, styles and abilities. My next pick is a craft and fabric shop called Masons [20 Bath St, Abingdon]. It’s actually in Abingdon rather than Oxford, but driving there only takes about 15 minutes, and the journey on the X3 bus from Oxford doesn’t take much longer. 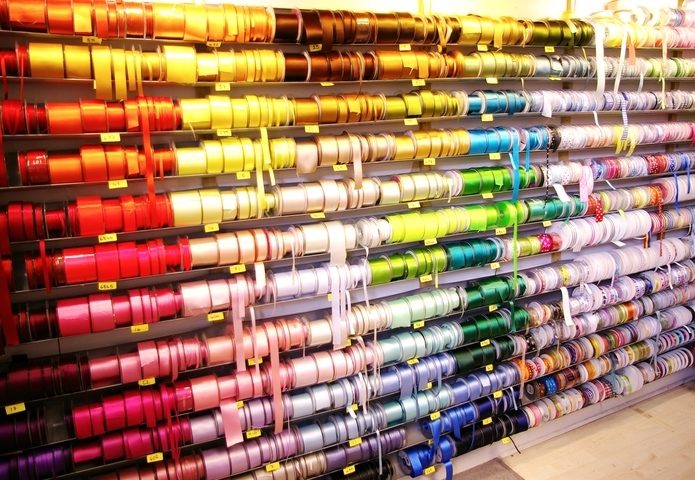 Mason’s comprises two shops, one of which has a massive selection of fabrics, and the other is more of a craft shop with a huge array of ribbons, cake decorating items, papercrafts and much more. I’m less of an artist and more of a crafter but Broad Canvas [20 Broad St] offers plenty for both artists and crafters. The ground floor has a dizzying assortment of pens, pencils and paints, the first floor houses a small gallery with frequently-changing exhibitions, and the basement is a treasure trove of crafty delights. The staff are happy to order in any supplies that are not currently stocked in the shop, and may be able to offer a discount to craft groups. Oxford is an inspiring place without even trying, but there are a few places to go that are particularly good for encouraging your creativity. 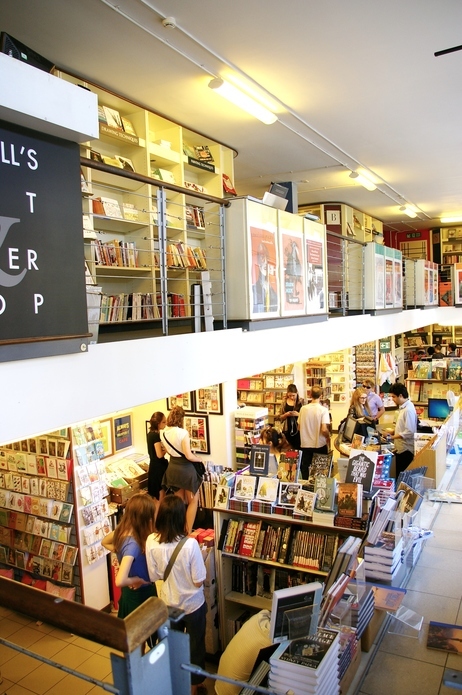 Blackwell's [51 Broad St] has a whole bookshop dedicated to art, craft and design (27 Broad Street, Oxford OX1 3BS), with two floors full of books and a good assortment of cards and posters too. Equally inspiring in a different way, the well-stocked main bookshop can be found at 48-51 Broad Street – seek out the unusual Norrington Room or check out the rare books department. The Story Museum [Rochester House, 42 Pembroke St] is a relatively recent addition to Oxford’s collection of museums, and “celebrates story in all forms and explores their enduring power to teach and delight” as well as offering a lovely little shop and café. Be inspired by the exhibitions, activities and ‘immersive installations’! Sewing types might be interested to hear about the ‘Stitch and Story’ volunteer group, who meet on an ad hoc basis when sewing skills are required. It’s ideal for people who are particularly interested in making costumes, stage props and decorations out of fabric. Contact Duncan at the Story Museum if you are interested in joining the group. Modern Art Oxford [30 Pembroke St] is somewhat hidden down a back street, but it’s worth a visit. It has “cutting-edge exhibitions of international modern and contemporary visual art” – and a lovely little café for when you’ve worked up an appetite discussing the unusual and thought-provoking exhibits. There are all kinds of places to eat and drink in Oxford. 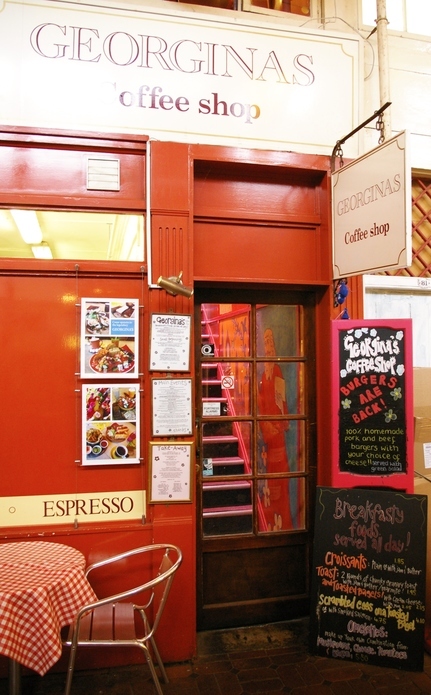 Hidden away upstairs in the Covered Market, Georgina's [3 The Ave] offers wholesome, generously portioned fare and a cosily ‘bohemian’ feel. The Turf Tavern [4-5 Bath Place] is well hidden down an alleyway but is a bit of an Oxford institution. 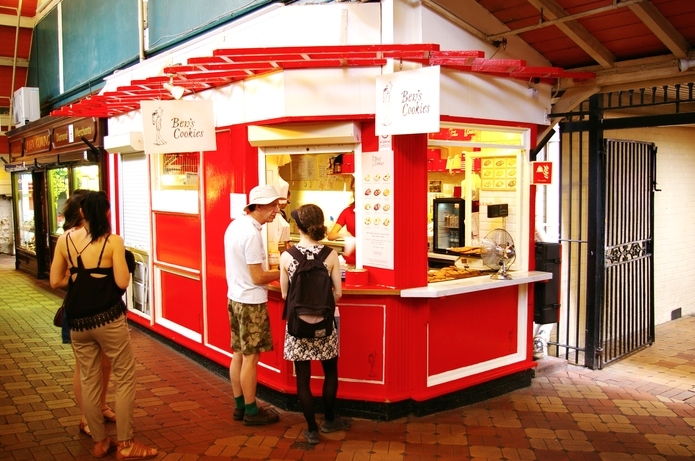 Popular with students (often a good sign), it offers reasonably priced, delicious food with a bit of a twist, in a historic building, parts of which date from the 13th Century. Although I have yet to eat there, Thaikhun [36 George St] is getting rave reviews from my friends. They’ve praised the Bangkok-style street food, the friendly and efficient service, the lively and comfortable atmosphere – everything! The Turl Street Kitchen [16 Turl St] places the emphasis on locally sourced ingredients and unusual yet still accessible dishes. It’s within an affordable price range, and they even offer a discount for students. The Old Parsonage [1 Banbury Rd] comes recommended as the best place in Oxford for Afternoon Tea and is popular with celebrating students and their families on graduation days. 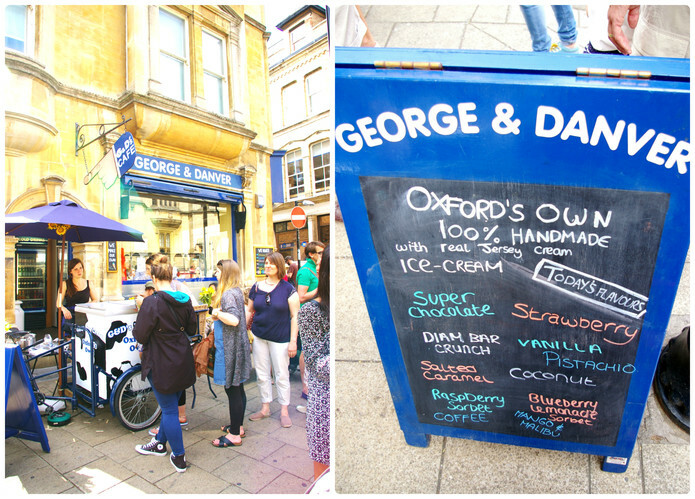 Another well-known Oxford institution is G&D’s ice cream cafés [55 Little Clarendon St]. Of the three locations, the George & Danver shop (94 St Aldate’s, Oxford OX1 1BT) is the closest to the city centre. All three shops offer an ever-changing selection of ice cream as well as baked goods, bagels and beverages. In the evening, The Varsity Club [9 High St] is a favourite. It has a great rooftop view of Oxford, eccentric décor, a chilled atmosphere and friendly staff. For a great choice of music and a decent selection of cocktails, try the Be At One [15 St Clement's St] cocktail bar down on St Clement’s, about 5-10 minutes’ walk from the city centre but in an area well served by buses for when you want to get home! Oxford’s craft scene is somewhat ‘underground’, so while there is a lot going on, it’s a bit on the secret side at the moment. There is an assortment of knitting groups including the Oxford Bluestockings and the well-established knitting circle at The Jam Factory [Hollybush Row]. Love Your Plane [Abingdon OX14 9EF, United Kingdom] is a small independent shop a little way out of town, selling screen prints, printing materials, books and homewares amongst other things. They also offer screen printing and lino printing workshops. The Old Fire Station [40 George St] is an interesting multi-use venue with a shop, gallery, theatre, café and studio, as well as space to hire. There are occasional crafty workshops on offer, and makers can apply to have their creations stocked in the shop. Alternatively, for something at the more glamorous end of the spectrum, Sew Curvy offers corsetry courses, deep in the Oxfordshire countryside, from complete beginners who haven’t sewed a stitch since school, to those with more experience and who might want to try drafting their own pattern. Crafty Networking is a fairly recent addition to Oxford. It is held at the Pitt Rivers Museum [South Parks Road] (more on which below) in collaboration with the O3 Gallery, and aims to “support craft-workers, designers and artists to make positive connections with like-minded people [and] … to put makers, sellers, bloggers, buyers and enthusiasts in touch.” Events are held four times a year and have previously included talks on topics as diverse as craft skills and social enterprise, digital media, and basketry. There are certainly plenty of spectacular sights in Oxford. 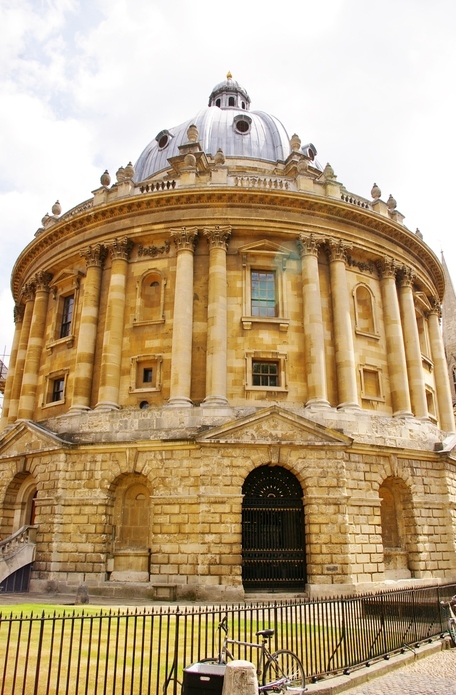 The University  buildings are all pretty magnificent, though I have a particular fondness for the Radcliffe Camera [Radcliffe Sq] and the Bridge of Sighs [Holywell St] which is just round the corner (New College Lane, Oxford OX1 3BL). I’m a big fan of The Botanic Garden [Rose Lane] in Oxford, a small but perfectly formed oasis of calm near the centre of the city. There are greenhouses and outdoor gardens and ponds to inspire you, and plenty of places to sit and sketch or craft (including Lyra and Will’s bench, for fans of His Dark Materials). Another of my favourites is the Museum of Natural History [Parks Rd]. The dramatic neo-Gothic architecture houses various interesting and occasionally interactive exhibits, from dinosaur skeletons to glowing rocks. Adjacent (and attached) to the museum is the Pitt Rivers Museum [South Parks Road] which houses “one of the world’s finest collections of anthropology and archaeology, from around the world and throughout human history”. It’s chock-full of exhibits from many different eras and places, including the famous shrunken heads! There’s also an annual event called Pitt Fest at which crafters can sell their wares. They’re a bit of a cliché but the best souvenir would probably be an Oxford sweatshirt, available from the many tourist shops in Oxford. Alternatively, if you are interested in Harry Potter, Alice in Wonderland, or Inspector Morse, amongst others, which all have a link to Oxford, there are plenty of souvenirs themed along those lines. Make sure you take plenty of photos too! 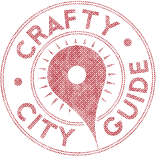 Want to take us on a tour of your town and write a City Guide for the blog? Send us a message!